Silent Infinity celebrated its second year anniversary this weekend with prizes and fun in its refinery system YQB-22 this weekend. Originally hailing from the Sukanan constellation in Tash-Murkon where they had developed strong relations with elements of the Curatores Veritatis Alliance which also originated in the Sukanan, Silent Infinity were given several systems in North-Central Providence this year by the CVA, joining the ranks of the Providence Holders. Since they AFK have built up their space, including two new outposts in YQB-22 and 3GXF-U. 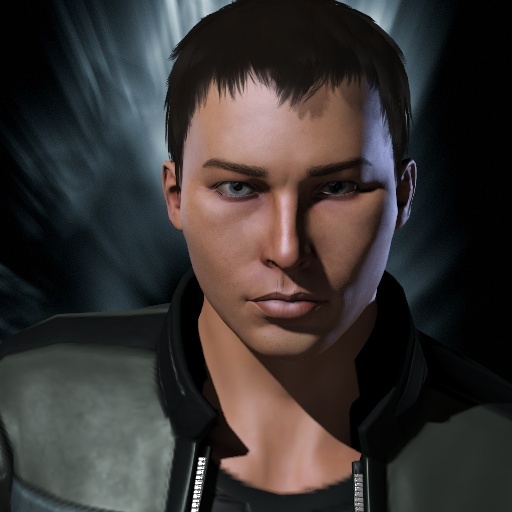 This weekend saw the celebration of AFK's second year Anniversary, including a cruiser tournament and the giving out of over 5 Billion ISK worth of prizes and rewards. Members in the alliance more than one year ranking highest on the killboard. 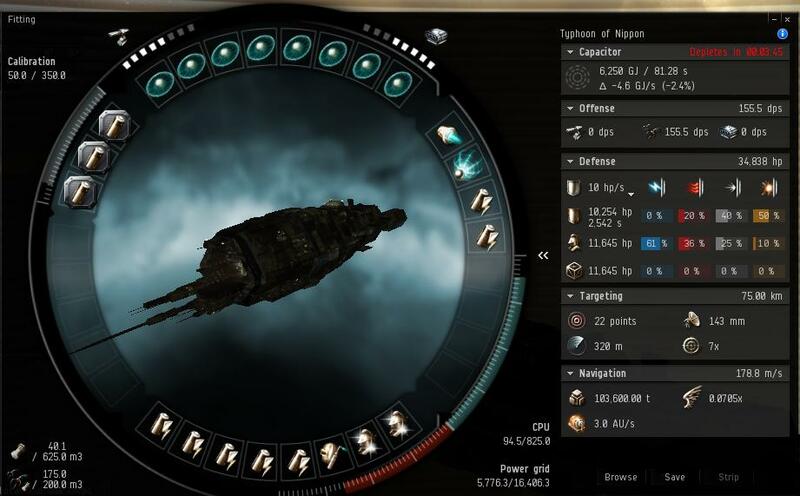 Each of the Top 8 Killers is receiving a Tier 3 Battlecruiser with fittings for fleet doctrine. Members in the alliance less than one year ranking highest on the killboard. Each of the New Killers This Year is receiving a Tier 1 Battlecruiser with fittings for fleet doctrine. Members in the alliance with the most participation in stealth bomber fleets. Each of the Combat Veterans is receiving a Stealth Bomber with fittings for fleet doctrine. This little gem (song) was linked by Codo from YF on theCitadel forums a few days ago. We'll scour the pirates from Providence skies! We'll hunt them like dogs till the last of them die. On Saturday the 22nd of September, relations between x-holder Eternal Evocations and the Providence Bloc turned sour quickly. 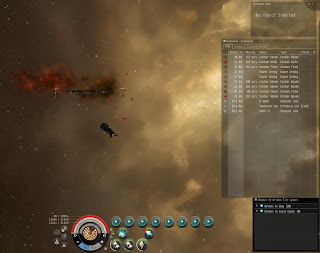 At 13:58 a roaming fleet comprised of Providence residents engaged and destroyed a [-E.E-] Thrasher in Catch at the orders of their FC. Five hours latter elements of [-E.E-] participated in the destruction of an A-Clinic Hurricane in Sendaya, Derelik. 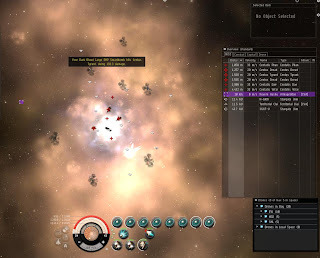 Within Provibloc there were moves to reprimand the Providence pilots involved in the thrasher loss and KOS requests over the hurricane kill were at least initially denied because the incident happened in Derelik and not Providence*. There were also offers to make the Provibloc FC pay for the thrasher loss. And than negotiations got ugly. [19:54:07] Raven Shadows > over a cane lsos ? [19:54:29] Raven Shadows > im still waiting for compinsation for my guys loss today ..
And so, as of now, Eternal Evocations are full KOS. 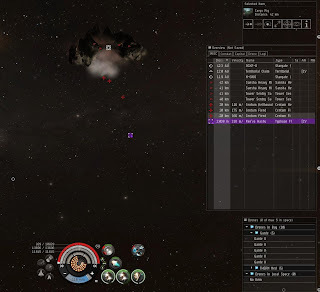 Provi Bloc people are free to engage them wherever found. Sadly diplomacy doesn't work all the time. *Side note, I note that technically Sendaya is in Derelik and therefore part of the Amarr Empire and therefore does qualify for KOS requests which are suppose to be restricted to incidents in Providence, the Amarr Empire, Wormhole Space, and ProviBloc controlled systems in Catch. Eternal Evocations Moving On . . . This past week saw Providence lose one of its holders. After internal deliberations the membership of Eternal Evocations decided that they would like to try something else and to leave Providence. After a peaceful evacuation E.E handed over their sovereignty. With the loss of E.E Providence is experiencing a bit of a shuffle of the current holders and the introduction of a new holder. 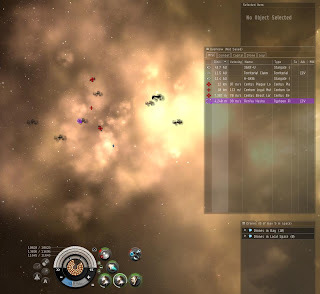 Long-term NRDS extremists and Providence residents, Yulai Federation are moving into the bulk of Eternal Evocations systems, taking control of XHQ and the entire JEIV-E pocket. Silent Infinity have inherited the H-GKI6 system within their pocket which had previously been E.Es. 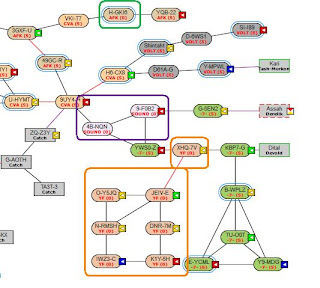 And finally the alliance 'Of Sound Mind' has joined the ranks of Providence Holders and have been given the E.E system of 9-fob and the -7- system of 4B-NQN. Currently it is planned for Yulai's previous systems to go to CVA, at least temporarily. Potentially we may be introducing a new holder and Apocalypse Now. are likely to receive a system or two however no concrete plans or decisions have currently been made. Silent Infinity [AFK] is pleased to announce the birth of our latest office outpost in 3GX-FU. This Gallente facility has an upgradeable number of office slots with fitting, reprocessing, factory, cloning, repair and other basic services. This outpost is named after the historical Arch Of Constantine in Rome that is inscribed with the words instinctu divinitatis ("inspired by the divine") and is heavily decorated with fragments of older monuments significant to achievements of struggles overcome. Magic Crisp the builder of the facility and his corporation Amarrian Micro Devices [-AMD-], who obviously enjoys building the tiniest of EVE’s devices, making this their second outpost completion. Knights Introna, CEO of Space Underground [SUPNY] the corporation that fully funded this project and retains ownership of the outpost, making office rentals open and available to all blues. Rin Tomoko, CEO of Order of the Golden Lobster [OGLOB], system owner of 3GX-FU, for providing needed system services to facilitate the build. Our friends and allies in CVA for the support given to us to aid in our growth and development. Veldspar miners all over Providence and Domain. Moons are freely available to blues with advance permission. Neutrals must apply to be blue before consideration. 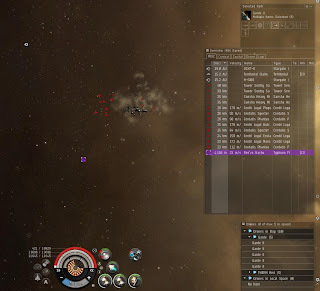 Please contact Raely, executor of Silent Infinity [AFK] about moon availability and standings by evemail with your request. 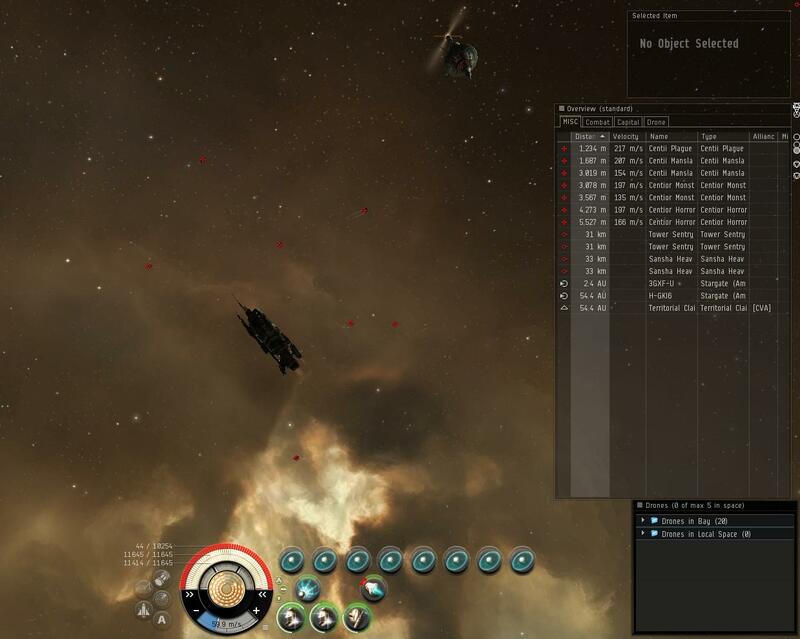 Eve Video: CVA Vs Darkside. A Thank you to Star Cloud from Frog Morton Industries corporation of the Anuran Origin alliance for linking the video on theCitadel forums. Almost a month ago saw the construction of a new outpost in 08Z-JJ in orbit of Planet XI. The 57th Outpost in Providence and the third outpost owned by Apocalypse Now. The construction of this Caldari Outpost will help boost manufacturing and research in the area. After its construction, the new outpost was blessed by Clergyman Rorin Cutter, Co-CEO of Deus Fides Empire of the Curatores Veritatis Alliance. "The word of the Lord is pure,It is a shield for the faithful,Brought unto men by the Angels,As a guiding light in the darkness "
Oh God Bless this station in your name! Give us the strength to reclaim every system in your name oh Lord! For we are your people, your retribution incarnate, and your angels of vengeance, and we will for sure overcome in your name! 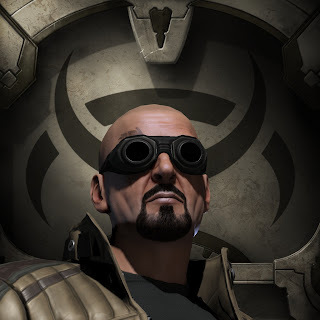 Amarr Victor Brothers and Sisters! and well done!" A than kyou to Sienna from Apocalypse Now. for the blessings logs and construction notification. Apologizes for the delay in this release. 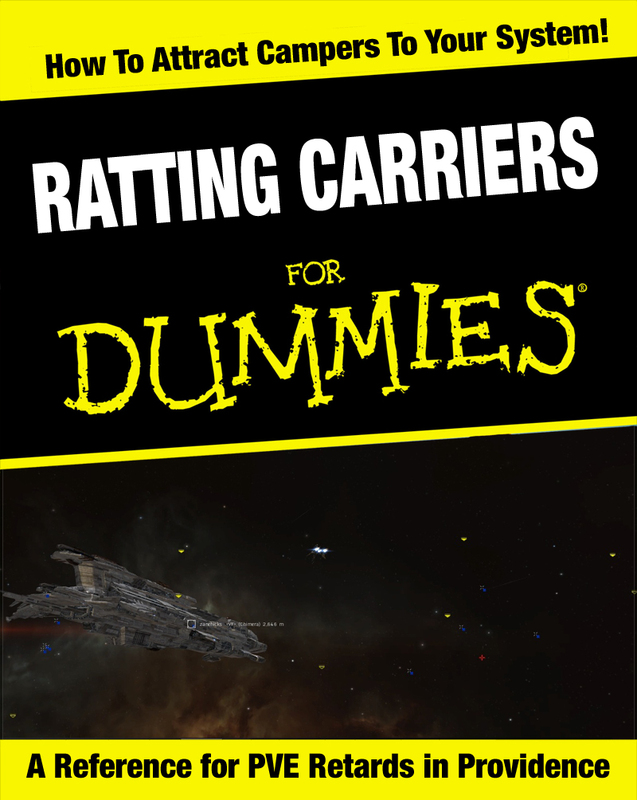 So in response to several comments in the ratting carrier articles about ratting in Battleships I'm going to be doing a three part series on Smartbomb ratting. While the fits I'll share aren't set in stone and are certainly tweak-able, and there may also be better ships to use or other formats, this is the way my corporation, Imperial Dreams, as developed our technique. When used properly and efficiently can produce up to 30 mil an hour ticks when working with another battleship. Solo it can make up to 15 to 16 mil ticks. In this first part I will be sharing ship fittings. My setup generally involves two battleships, which I run on two accounts together. This isn't necessarily required as you can easily either work with someone else when running the more advanced sites or you can even use this set-up solo with specific anomalies. The Ships I use are the Typhoon Fleet Issue as the smartbombing hull and the Armageddon Navy issue. The reasoning behind the Typhoon Fleet Issue over a normal typhoon is the larger base armor and shields and faster speed. The reason I prefer a Typhoon hull to say an Apocalypse is the greater speed and the base EM resist bonus that Minmatar hulls receive. The reasons behind using the Armageddon Navy Issue over saw a normal Armageddon is for three reasons. First it has higher raw armor and shields than the base hull. Second it has an extra medium slot. Third is its increased drone capacity allows it to not only carry a full flight of sentry drones but also a flight mediums (or two flights of lights) for situations when you might need them. My fit puts its emphasis on capacitor generation. 8 Large smartbombs will drain your capacitor very quickly. 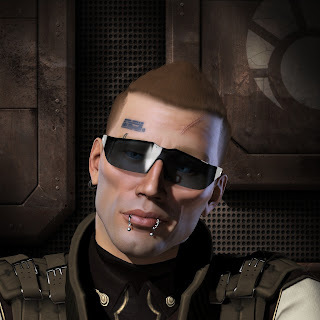 I have generally preferred Meta 4 Large Armor repairs on my ratting ships, mostly because I have generally not needed the extra repair amount that a tech II armor repair provides. It also uses less capacitor overall which is generally what I am in need of the most. My Large Slots consist of a mix of 8 True Sansha and Dark Blood Large EMP Smartbombs. You can use any combination of faction smartbombs as the three Navy versions and the two Pirate versions have exactly the same stats. This allows you to shop around on the markets, picking up whatever combination is the cheapest for you. Using faction smartbombs is pretty important. not only does it provide extra damage than its T2 counterpart, it also has an expanded range (7500 meters) which means your hitting more ships for longer periods of time. 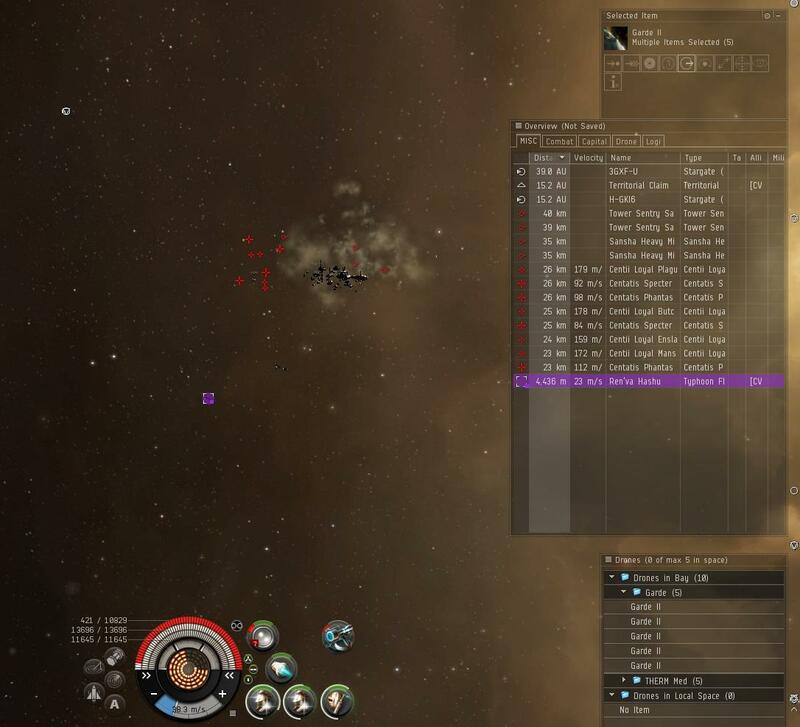 When I first started ratting faction smartbombs were running around 70-80 million each. Now they are between 100 million and 120 million. But when your making 30 million ticks, it doesn't take long to recoup your investment. Lastly my rigs are all Large Capacitor Control Circuit Is. With this fit, running all the modules, I become cap dry in a little over three minutes with Energy Pulse Weapons V. However you will very seldom be running your afterburner and your smartbombs at the same time. The theory behind smartbomb ratting is to sit on the spawn/respawn and smartbomb things as they spawn. This involves no movement so your afterburner is mostly used for getting to the spawn after warp in. The fit for my Armageddon Navy Issue emphasizes two things, raw damage and capacitor longevity. In this case I do have a faction module in my lows, in this case it is simply because I had it on hand and the extra resists were nice when I was using the fit solo against hubs and ports. Rather self explanatory, afterburner to get into optimal faster and cap rechargers for cap regeneration. I find the tech II Pulses very convenient as it allows me to utilize Scorch Crystals in the rare cases when something has managed to get far away. Normally I use IN Multifrequency or IN Gamma and carry IN Infrared for long-range stuff. The next key fit for this ship is drone layout. When working with the smartbomb battleship you want to use sentries, Garde IIs are the best choice around here because of their thermal damage against Sansha rats. Being a Geddon Fleet Issue also allows you to run a complementary set of medium drones or two flights of light drones, for the pesky frig that spawns too far away. In general these ships are fairly light on their tank, only tanking the bare minimum. Alone the Armageddon Navy Issue can tank a hub as long as it stays afterburning underneath the Sansha guns. (Yes you can sig tank rats in battleships). If your wanting to run harder anomalies or use these settups for other things I suggest running a heavier tank. But you need to be careful, the Typhoon Fleet Issue is at a sharp balance between armor tank and capacitor life. I have never had a problem but if your armor and capacitor skills are lacking you may need to overtank. While ratting alone can be simple and relaxing, its not nearly as efficient as working with another character, either a buddy or an alt. 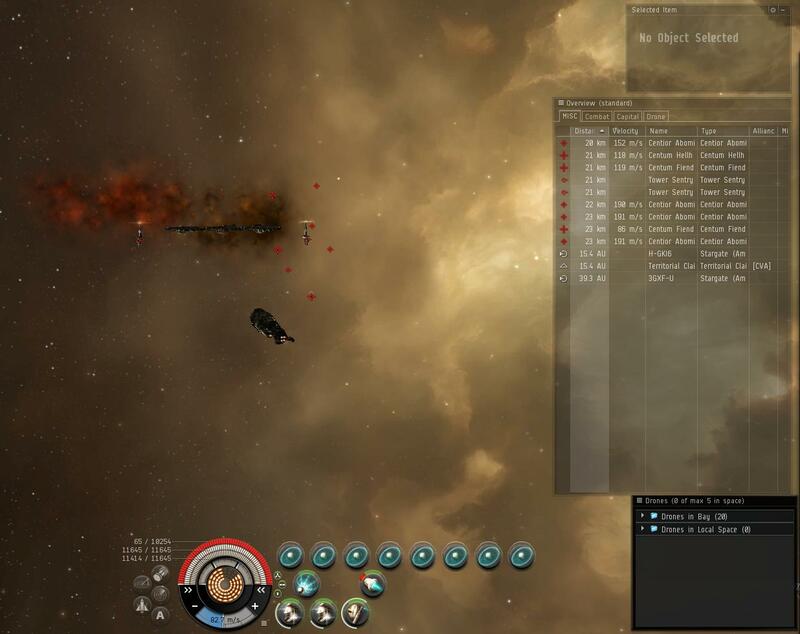 A smartbomb battleship in unison with a turret battleship can earn twice the ISK as a lone smartbomb battleship. When looking for the right anomalies to work, your looking for similar characteristics that a solo SB battleship will be looking for, specifically ones with spawns that are close to the warp in and where the spawns do not move from wave to wave. Unlike when solo however your also looking for large numbers of battleships as your turret friend is very good at blapping those away. 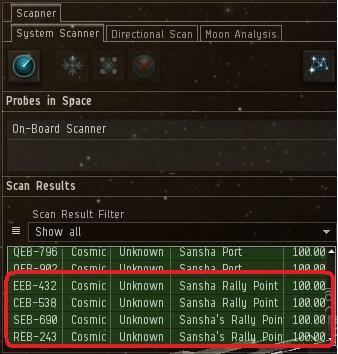 In Providence two types of anomalies that you will find in any fully upgraded system are Sansha's Forsaken Rally Points and Sansha Ports. The system where the image on the left was taken has a security status of -0.07, one of the worst in Providence (Only 13 other systems have worse (higher) security status). When fully upgraded, this system will have two forsaken rally points which is generally what your looking for. Forsaken Rally Points are ideal for the smartbomb form of ratting. The spawn is roughly 10 km from the inital warp in. It never moves, and although the area that ships spawn in is slightly larger than other anomalies, the range of your faction smartbombs means its generally not an issue. It also routinely has 3-4 battleships per wave which means your turrent battleship is going to be busy. Ports are also fairly good but not quite as ideal because their spawn is 20km away from the warp in and they have fewer waves and less battleshps per wave. 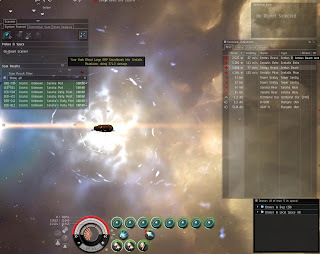 While some people might consider trying to run Hubs I would generally suggest against it, because of the higher dps in the inital spawn and the significantly longer travel time from your warp in they take longer to run and generally are more dangerous, even though they provide a better reward per anomaly run because of higher battleship counts per wave. The warp in will generally put you 9-11 km from the spawn point which is in the center of the wrecks in the gas field. The initial spawn consists of 1-2 battleships and 1-2 cruisers, in this case it was 2 battleships and a cruiser. This image shows a top down view from the smartbombing battleships pov. Notice the placement between all the wrecks and the Armageddon Navy issue's placement 10ish KM away. I can normally get away without moving the ANI but sometimes on the warp in its in the inside, in that case you normally want to move away a few kilometers to place yourself in a better position, optimal wise. You normally want to be at LEAST 9km away from the SB battleship so you can safely deploy sentry's for each wave. The final spawns for FRP's are easy to identify as they will be a full wave of battleships, either three or four. Just a notice FRPs escalate into 8/10s, which while they drop a higher overseer loot, generally produce lesser quality loot drops than 6/10s which you can get from Sansha's Rally Points that you run solo. Ports have three initial spawn types. The first type will have a mass of frigates and cruisers centered around a control tower. The control Tower is your spawn point. This one can be a bit tricky as the turret bs can have a hard time hitting the frigates and if they get under its tracking. The best way to handle this is quickly get the smartbomb battleship to the spawn and actively smartbomb, if your lucky you'll clear the frigates before they are able to disperse in their orbit around you. The cruisers are generally easier to handle. If the frigates do get outside of smartbomb range and your having problems hitting them, this is the time to use those drones you've brought along. The Typhoon Fleet issue can easily carry several flights of lights and mediums. Lights in particular are good as they can return quicker allowing you to restart your smartbombs (which you turned off to let your drones out). Be very careful not to smartbomb your drones. Once they are back light them up and blap the battleships. The second type of initial spawn involves three cruisers about twenty kilometers from your warp in between you and the sentry towers. The initial spot of those cruisers is your spawn point, your going to have to judge this a bit and readjust after the first wave is done. I generally quickly try to kill the crusiers with the turret battleship and use the first wreck as a rough guide for the SB battleship. The third type of spawn is just like the second only it will have four battlecrusiers instead of three. You handle it exactly the same way. Ports finish must fast assuming you don't take too long on the inital wave. They lack the number of waves and the heavyness of the waves that Forsaken Rally Points put off but still work fairly well producing 15-20 mil ticks generally for both pilots. Several things to keep in mind when running with Armageddon Navy Issues. Watch your sentries! It is very easy to lose several, either because you place them too close to the smartbombing battleship or because they are targeted by a new wave. Rule of thumb is to pull your sentries after each wave than put them back out after you put the first battleship into armor with your turret battleship. 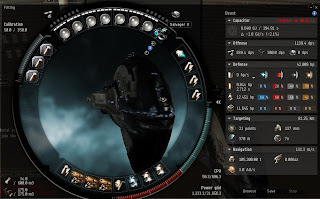 You also need to watch your smartbombing battleship if your duel boxing this setup, its very easy for it to wander off the spawn if your not paying attention or hit the wrong button, this can seriously mess up your efficiency and cost valuable time that you could be making isk in. If both characters are paying attention and on the ball, you can easily be making 25-30 mil a ticks, which equates to 75-90 mil an hour, or 150-180 mil an hour if your duel boxing. This is one of the simplest ways to run anomalies well that doesn't involve massively pimped ships (apart from the smarties) and is potentially doable in every system in Providence. 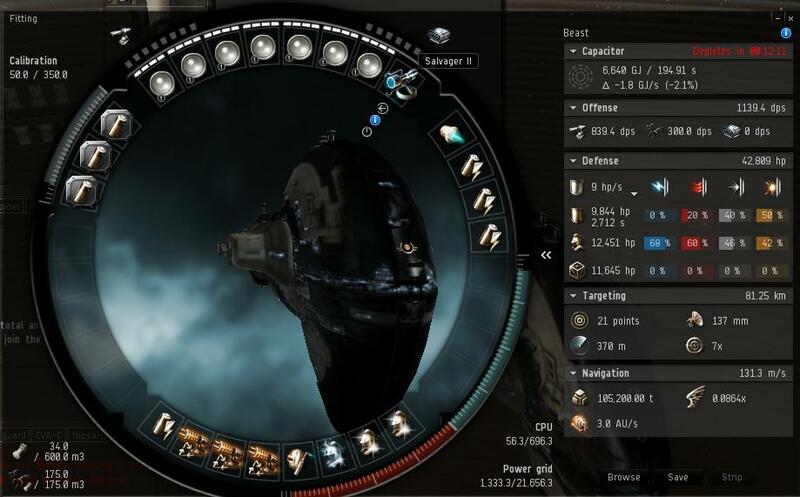 In theory any system in Providence could be supporting up to 6 characters making 45-90 mil isk an hour using these setups these techniques. 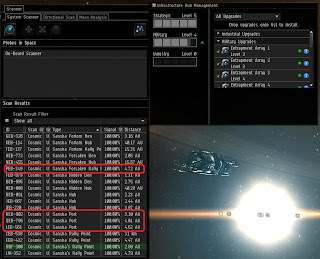 (Two people running Sansha and Sansha's Rally Points as solo smartbombing battleships and two teams of SB BS and Turrent BS running Ports and Forsaken Rally Points). When your going to try smartbomb ratting solo you need to be very careful which anomalies you try to run. 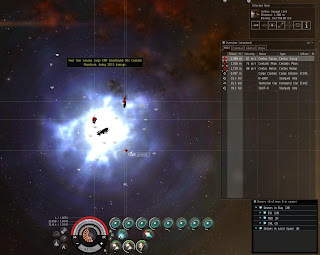 Several important keys to the right anomaly include distance to the spawn from your warp in, location of subsequent spawns, and the number of battleships that appear in each spawn. If the warp in is 50 km from the spawn, your going to waste a lot of time traveling. During that same time your taking damage, your not set-up to be an uber tank, and this can lead to some harry situations as you travel through the rat optimals to get to them. Different spawn locations for each wave can also be an issue. First your wasting time traveling between the spawns, your also providing time for the rats to move around so they are not going to be at the same spot but will try to stay at their optimals to you, forcing you to chase them down or use drones to kill them, which is something you only want to do as a last resort. Finally you don't want more than two battleships spawning in any specific wave. While working with someone else this isn't an issue as the other person is blapping the battleships with guns, but when your main weapon is smartbombs, killing a battleship before they get out of smartbombing range can be problematic. With just one battleship in the spawn it is less of an issue as you can potentially follow them a bit without wandering off the spawn. With more than one battleship it becomes more difficult, which makes that web on the smartbombing battleship important as it allows you to control hostile bs speeds, providing you more time for your smartbombs to apply damage. Smartbombs themselves don't do a lot of dps, but they do it to a lot of hostiles at the same time, so keeping the rats within range of your smartbombs is key to ratting with them. In Providence, two anomalies stand out. The preferred anomaly to smartbomb in solo is Sansha's Rally Point. The main reason for this is the warp in is within 2 kilometers of the spawn for this anomaly. Rally Points are also nice as they are predominately frigates and cruisers which die quickly to smartbombs. They also have either a single or duel battleship spawn in their last wave. The finishing touch is their escalation. Sansha's Rally Points escalate into 6/10 plexes, which have the possibility of dropping Centum A-type loot including A-type EANMs which run up to a billion isk. While your generally going to make between 12-16 mil a tick running theses solos, when you get several 6/10 escalations a week with up to a bil drops in faction loot, the isk quickly adds up. The other option is Sansha Rally Point (notice the small title difference). While very similar to Sansha's Rally Point, Sansha Rally Points have a few quirks. The biggest one is the respawn is roughly 20 km away from the warp in. This can slow your attempts to clear the site down as you need to travel to the spawn. It also has a slightly heavier initial spawn (Sansha's Rally Point is all frigates while Sansha Rally Points have a mix of cruisers and frigates). If your lucky you can afterburn to the 'clump fast enough and get at least the frigs with your smartbombs. However if they aggress and move to their optimals quick enough, you'll likely find it easier to kill them with drones and focus on deploying on the spawn to use smarties for the next wave. Once your on top of the spawn and the initial wave has been killed the remaining waves will play out the same with either a single or duel bs spawn in the final wave. 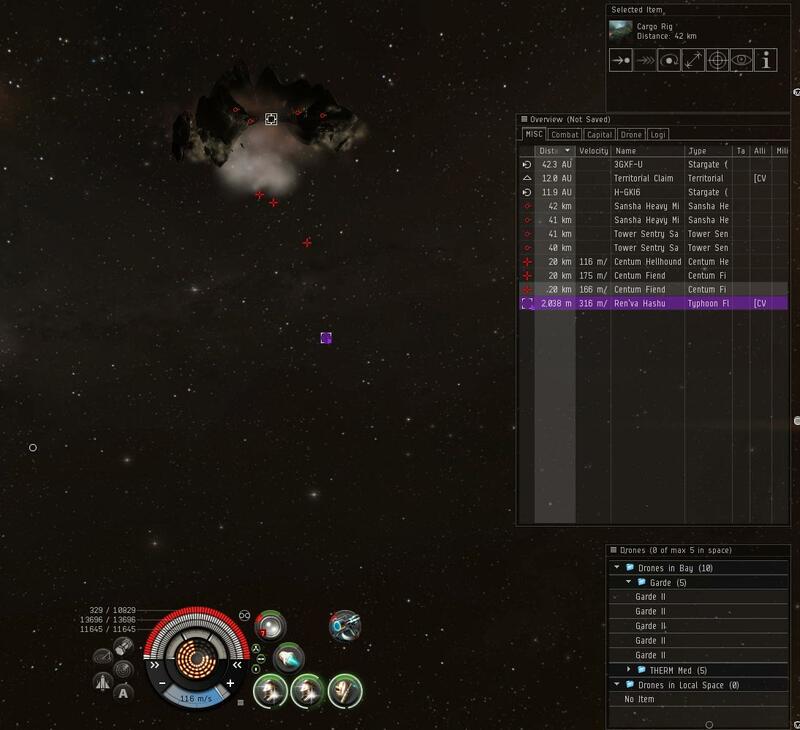 Inital Sansha Rally Point Spawn, note this spawn is near the right tower. Had to use drones to finish the last part of the initial wave. In the initial tick I ran two Sansha's rally Points and part of a Sansha Rally Point and earned over 13 million isk. Note this wasn't efficient as I was taking screenshots and waiting between warping to anomalies to do other things. I've made 15-16 million ISK a tick off of bounties when actually paying attention. The nice think about smartbomb ratting, especially when running Sansha's is that it is very simple and doesn't require too much attention. After your initial warp in and F1-F8 of your smartbombs you theoretically don't need to do anything till the final spawn as you should be able to kill everything before they get out of range except the battleships. I would like to introduce a new segment on Providence news titled Hashu's Blog. Till now Providence News posts have been just that, simple informative news briefs. Hashu's Blog will be slightly different, including things such as guides, personal stories, and other segments that may be less focused on the bare facts or announcements and more about stories, opinions, and guides, etc. Basically non-news posts. The first segment will be a simple guide to the form of smartbomb anomaly running with Battleships that Imperial Dreams corporation pilots have developed. This technique was pioneered within Imperial Dreams by Wariak but we've seen other groups and corporations use similar set-ups throught Providence and New Eden. CVA doesn't have very many rules when it comes to making money or extracting resources from providence. We are generally pretty open to letting people come in and do what they will as long as they don't bother anyone else. One exception that we enforce however is a ban on the use of capitals when it comes to ratting in belts or anomalies. 1. The rule is that there is no ratting capitals allowed. 2. If you do not like this rule there is thousands of systems in eve that do not have this rule, so you are free to go there, and rat in carrier to your hearts delight. 3. No one has given a single reason WHY carrier ratting is better which is what the title of this thread seems to be about, it is only a place where people complain because they are "not" allowed to do something. 4. 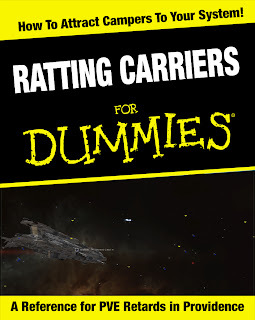 Faction/Pimp fittings are allowed (although quite useless most of the time)....i'd perfer people use common sense but well, when we have 7 pages of thread about ratting carriers i guess that is in short supply. 5. If you do not like this policy you have 3 options, convinve me personally why they are better, and thus should be allowed, kick cva out of providence and establish your own policies, or find a place to go rat in carrier unmolested. There are a number of reasons behind the ban. 1) Carriers aren't efficient, BS can easily out earn carriers when it comes to running anomalies. 2) Capital Kills carry significant trophy value to roaming hostiles, even beyond expensive faction ships. Their loss also tends to affect the general morale of the area. The loss goes beyond just the financial loss of the pilot but includes the morale loss to the organization that the pilot belongs to. 3) Ratting capitals attract attention. Hostiles will camp systems which routinely have capitals ratting in them. This affects not only the capital pilot but all the other pilots in the region who use that system to rat..
4) Tackled capitals attract lemmings. When capitals get tackled often people will charge into attempt to save it, unorganized and unequipped to deal with what is holding the capital down. Many experienced roaming commanders will tell of their favorite fights where they tackled a few carriers and managed to kill several times the carriers value of people trying to rescue them. Some people have asked about sitting on POS shields and assigning fighters, claiming they are perfectly safe. Potentially they are, assuming they can react and get within the shields in under ten seconds. DDs have been reported to follow capitals inside pos shields of the doomsday has spooled up before they enter, which can take as little as ten seconds. So what happens when we catch capitals ratting in Providence? Generally we tell them to stop and dock up. We also will inform their CEO. If they refuse or it becomes a habit we may be forced to ask the person or corporation to leave the area. Attacking the ratting capitals ourselves remains a final but potentially valid option. In Short, ratting in capitals is inefficent and attracts attention we don't want, as a result the practice is banned. Despite the ban it still happens. While we generally use diplomacy to stop it we are not above using force as a deterent or punishment for the continued practice. Assuming hostiles don't beat us to the punch. 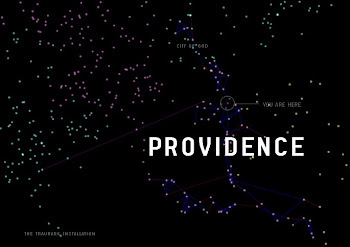 Providence tends to lose at least three to four ratting carriers a month. While people man not like this rule, it will not be changing anytime soon.